That time when everything starts happening all at once. School starts and then every festival or event I really care about happens over the next two months. Here is a list of startup/entrepreneur events you should be excited for. 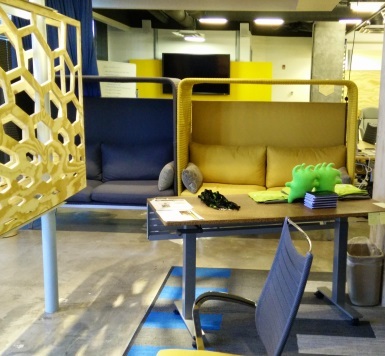 August 21, Tech.co Pitch Night – Check out the pitches for ABQ Startup of the Year. August 27 – 28, ABQ Mini-Maker Faire – Two days of making, building, creating and learning at Balloon Fiesta Park. September 9 – Cultivating Coders – Demo and graduation day. September 9 – 11 – NM Game Jam – 48 hour event to develop your own game. September 15, Deep Dive Coding Demo Day – The summer cohort of students show off their projects. September 28 – 30, Experience IT – A weeklong event showcasing technology in our community. October 6, Rise of The Rest – Steve Case comes to Albuquerque for a $100K pitch contest. The next two months are some of the best in Albuquerque, if only there was more time to do everything. 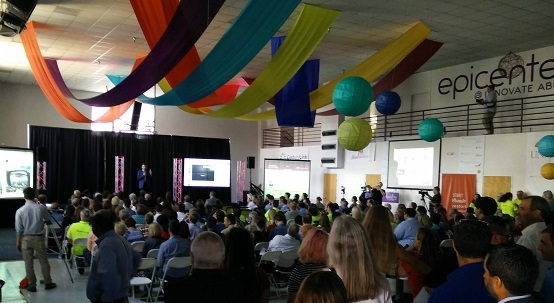 Last Friday was the ABQid Demo Day and it was a packed house at the Epicenter. I rarely get to see these type of activities, but my wife let me use some of my paternity leave to check it out. The energy and excitement of these events blows me away every time. The presenters, sponsors and audience create an atmosphere that makes it real easy to believe a lot of great things are happening and going to be happening in Albuquerque. This event allowed the 10 companies from the second ABQid accelerator class to pitch their company in 6 minutes. They all did a great job on their pitches and I feel lucky to have gotten to watch this. Equiseq (Paul Szauter) – I can’t remember where I first heard about Paul Szauter, but I have been interested in his technology since he first introduced it as ElectroSeq with the goal of $100 full DNA sequencing. I love biotech and DNA research, so I was particularly interested in his company. As much as I want to see $100 DNA sequencing, I think he made a great pivot into Equiseq to put his technology into a completely new field with horse breeding. He did a great pitch to start off the demo day and if I had remembered to vote, I would have voted his the best. It may be my bias towards biotech, but I think he has the most potential of making a big impact with his company. Bounce Chat (Gordon Schaeffer) – Like biotech I am also a big fan of location based apps and augmented reality apps. Bounce Chat is a location based app where you can send out a message only to people who are within a set physical distance from you. I love the potential for this and one can easily picture it being a staple marketing item for events, conferences, parties, etc. My only problem with it is I can’t play with it. Like the similar startup Glif, it is IOS only so I can’t review it or promote it until it is on Android, but if you have an iPhone you can check out the app. They won the community vote. Close Threads, Trisha Terhar – Close Threads brings the boutique clothing market online. The goal is to allow small shop, custom atmosphere and allow them to compete online. You can sign up for early access at their website. As Girls Grow, Akamee Baca – As Girls Grow is creating a subscription product that combines STEM lessons, with physical toys that demonstrate the lesson, and online stories and community to support it. It seems like a great model to get girls interested in engineering or for home schooling parents to teach STEM concepts. This is getting to be a crowded field with more and more subscription based STEM ideas, I recently subscribed to Hacker Boxes for myself and kids. Maybe the focus on girls will be their niche. It seems a bit over the top though. The stories and characters and digital component to it seems like a lot of work without a lot of value added unless it truly works as a hook to get girls interested and staying with the product. Explore Media, Elan Coehlo – Their pitch was primarily about ARVRUS a 3D video player website that can be branded by companies. It seems that this was and idea they made or refined at the accelerator and what they are looking for as the massive growth part. From the pitch (and their website) they are doing a lot of virtual reality stuff without a specific focus (until now?). I was left with more questions about the company than excitement for the company based on the pitch and unfortunately I wasn’t able to stick around to talk to them or see their VR headsets. There is a VR Cafe event as part of Tech Fiesta this year. It is September 14, at Stereo Bar and looks like a fun event. iTherapyDocs, Lisa Brow – They are looking to provide software to for companies billing to Medicaid that ensure the proper documentation and paperwork are submitted so companies get properly paid and not accused for fraud. Seems like a hard problem navigating the laws and requirements. It was a great pitch, even if it isn’t exactly an exciting problem to solve. OAC Gallery, Sarah Biondi – A simple concept: buy art online. There is a lot of potential with deals with interior decorators and designers. I wonder if production companies and home stagers would find it useful also. If they can get a reputation with the type of companies that need high quality, matching artwork quickly, then they could build strong reputation. It is already up and running, check it out. Pressure Analysis Company, Michelle Urban – This is an exciting company, basically they have a cap worn on the head to detect impact, record it, and produce analytics on athletes. I haven’t heard of them before, but they have quickly become one of my favorite startups and one I hope to watch. It is easy to picture a world in 5 or 10 years where football, from the NFL to high school, require independent monitoring of player head impacts. You could also picture a world where a college athlete could provide all their analytics for every impact they had to NFL scouts and those that don’t were considered riskier draft picks. There are lots of scenarios where there is a need for tens of thousands of cranium impact monitors and the accompanied data storage and analysis. The thing I love the most how much of a product of UNM this is. The tech was created and licensed by UNM to a UNM alumni creating the company and testing being done with the UNM Lobos and Duke City Gladiators. This is just a great example of all the pieces, so far, coming together to build a company with a lot of potential. sheSPIRE, Renay Moya – I was not terribly excited about this startup. It seemed like personal mentorship wasn’t something that could scale to be a large profitable company. However, Renay gave the most passionate and personal presentation of all the pitches. She did an amazing job and I can now see the growth potential where sheSPIRE is a combination of eHarmony + LinkedIn for connecting those in need of a mentor with a personalized mentorship. Explained that way it is easy to see how it can position itself for rapid growth. Teeniors, Trish Lopez – Teeniors was the second most personal speech and a great example of how this company creation process in Albuquerque can work. I mentioned earlier this year that Teeniors won the Startup Women’s Weekend. From there they kept the idea alive and were accepted into the ABQid program and now they have come out with it with a company that has clients and is growing. Teeniors connects teenage mentors with seniors that need personal help with technology or computers. I am not sure how this scales as a company, there does not seem to have any potential for high growth. That said, I think Teeniors could be one of the most important companies for changing Albuquerque for the better. It is certainly the one I want to see succeed the most. Trish told the stories of the seniors and teenagers who had been paired together and it is amazing to picture how life changing and how meaningful to the teenagers and to the seniors something a company like this can be. It feels such an amazing emotional niche. Teens who want to be respected, helpful, useful, appreciated and valued. Seniors, who need help with technology and a personal connection or time with people. I am really excited to see if they can connect teens and seniors on a much larger scale. So far I haven’t found any videos of Demo Day, but there were lots of people filming so I am hoping to start to appear soon. There are a lot of exciting events on the horizon for programmers and software engineers in Albuquerque. I am disappointed that I don’t have time to attend all of these. Must find a way to create more time. Android App Clinic, January 17, Learn Android development. Lavu Hackathon, January 23 – 25, A second Lavu Hackathon. If you missed the first one this is your chance, it was one of the funnest programming activities I have done. Global Game Jam, January 23 – 25, If games are more your style check out the Game Jam. BowTie Springboard, January 31 – February 13, Use the BowTie platform to create a new project. Register by Jan 30, intro Jan 31, Demo on Feb 13. My understanding is that for the Youth Startup, they have adult programmers help get minimum viable projects up (if needed), so contact the organizers if you are interested. For Startup Women, men can participate too, as long as the teams and projects are led by a woman. Finally made it to 1 Million Cups last week. This was last regular meeting of the year and I was glad I was able to attend. At 1 Million Cups two presenters talk for six minutes and take questions and comments afterwards. The first presenter was Peri Pakroo. She spoke about her online creative magazine Pyragraph. She talked about her publishing model and her launch of their premium service and a podcast called the Self-Employed Happy Hour. Peri made a comment during the Q&A portion that California usually edges out New Mexico in unique visitors maybe there will be enough publicity from 1 Million Cups to put New Mexico in the top spot. The second presenter was Dara Ambriz who is co-owner of Runway Apparel. This was her second time presenting and she was updating on all the community activities she has been involved in, such as Hautepreneurs and Diner en Blanc, her fashion trips and experience with her business. One person described her passion as ‘contagious’ and it is. When you see one person being so involved it is inspiring. I would go further thought and say the whole 1 Million Cups crowd has a contagious atmosphere. Everyone there seems ready to do what they can to help each other and promote Albuquerque and simply make things happen. Check out the ABQ 1 Million Cups channel, I am enjoying going through them. Dara’s first presentation is there as well. I am hoping they get more videos up. This is really a great time to be an entrepreneur in Albuquerque and with what is starting and what is growing I think next year is going to be even better. I will never look at games the same way. Every time I click or perform an action I am going to think about how many lines of code it took to make it happen. He has been unwavering in his dedication to being a science major and becoming an astronaut, but he said it might be interesting to be a programmer. This is the first time I have ever even heard him consider something different. What resources are available for a teenager to learn programming in Albuquerque? If they don’t have a class available at school (which most don’t), they are forced to learn it on their own. There are a numerous high quality online resources to learn programming, but it isn’t the same as a class or working with others. Hour of Code did a good job of getting them interested, but what is the next step for an interested student? Private tutors, online learning or technical parents; that isn’t exactly opening up programming to everyone. Are there any clubs, programs, classes in other cities we could copy? Or any resources here I am missing? All I can think is that the kids are smart enough to see when adults don’t mean what they say. We can preach that every student should learn to program, but if we don’t require it in school or provide a way to teach it to them, will they believe us? And more importantly do we really mean it? The first Lavu API hackathon occurred this weekend and I was lucky enough to be able to attend. 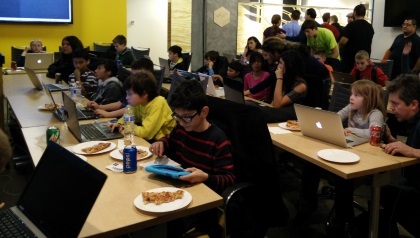 This was my first time attending a hackathon. I had no idea what to expect, but it is something I had always wanted to do and luckily it ended up on a weekend were I had no other obligations. It was a blast! The Lavu employees did a great job of making everyone comfortable, there was a ton of food, drinks and even some swag. They explained their API and they have a web view section (that I think they just implemented) that allows the developer to add a tab into the actual Lavu interface pulling content from their own system. This allows developers to tightly couple their modules into the actual system and seems like a powerful piece of extensibility. Everyone there was friendly, helpful and had interesting ideas, it was great getting to meet other local programmers I wouldn’t otherwise know. This was also my first time at the STEMulus center and it a beautiful setup. It was perfect venue for this event, plenty of monitors, rooms to work in, and areas to relax. I think it was a success for Lavu, and the people that went, I certainly learned a lot and it was great having a project with a set deadline and just powering through a bunch of code with little distractions. It sounds like they learned a lot from this and will be trying to do again in the future, so if it interest you keep your eyes out. I think they main thing that can be better is to get more information about the event out sooner, that should attract more turn out and give people a chance to come up with better ideas. I couldn’t even find any public information beyond the date and place until a few days before. This is just the type of event that Albuquerque needs to grow as a tech and startup community. It gives developers a chance to practice, learn and network. It lets the company meet local developers, get real feedback about their product and some new ideas. If everything goes right it could give a developer some income and the company a new product. As a programmer I felt it gave me a chance to learn about my abilities and real insight into how I program and what works or doesn’t work. I’ll share those later. Next up is another trip to the STEMulus center, this time with my son for the Hour of Code event on Thursday. Bring your K – 12 year old.